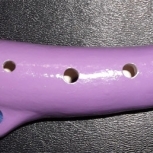 This ocarina is made from white clay and has been given a non-toxic finish. 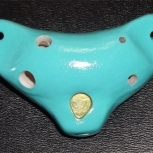 There is a spiral imprinted on the mouthpiece painted gold. 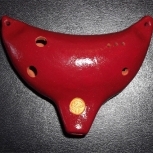 It is a 5 hole ocarina, is tuned to F#, and has a total natural range of F#5 to Ab6. It can be worn as a pendant. 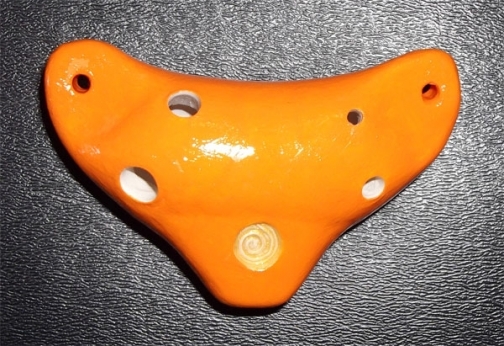 All English ocarinas come with a string, owner's guide, and song and scale sheet! Item ships from: Port Alberni, BC, Canada. $8.00 CAD ($8.00 CAD when combined with another item) by Canada Post. If the item(s) arrives damaged or is lost in the mail contact me and another will be sent. If you are not satisfied with your purchase contact me and we can arrange a refund or exchange.